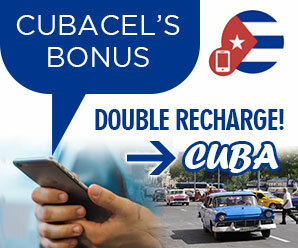 cubaoldhavana.com | Want to know before you go? Official Cuba Old Havana information and guide, get facts and latest news. Casa Ladys is situated in the core of Old Havana, considered by many as the ideal place to stay in Havana, with its historic atmosphere, thin colonial streets, momentous squares and striking colonial architecture. Yet, just a 10 minute walk from the old town you’ll discover Centro Habana and Vedado. Venturing a little further by way of a 10 minute taxi ride along Havana Malecon and 5th Avenue, you’ll enter the posh Havana neighborhoods of Miramar and Cubanacan. 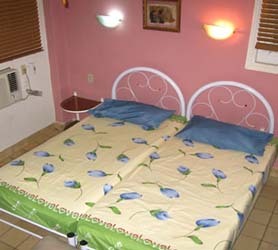 Casa Ladys is in an outstanding location from which visit Old Havana on foot. Directly from your base at Casa Ladys you’ll be able to view Old Havana’s myriad of historic buildings and facades. Old Havana is both momentous and exhilarating and Casa Ladys will have you directly in the nerve center of the old quarter. Casa Ladys offers spacious rooms situated in an historic building, all rooms feature; shower, refrigerator, TV, air-conditioning and an outside terrace to soak up the Caribbean rays and bustling street life. Your Cuban hosts at Casa Ladys are tremendously clued-up about Old Havana, providing free advice on revealing the many mysteries of the old town of Havana. You can opt to take breakfast and meals at Casa Ladys or choose from the wealth of cafes and paladar restaurants in Old Havana or the Havana Oceanfront Boulevard called El Malecon. Close to Casa Ladys you’ll find popular Paladar Restaurants in Old Havana such as Restaurant Castropol and Café Neruda on the Malecon. 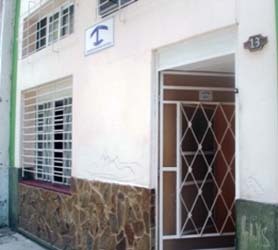 Casa Ladys is located right in the center of Old Havana just a short distance from foremost tourist attractions like the National Museum of Music Havana and many more. However, Old Havana is but a short distance from Vedado, Centro Habana and Miramar, so you’re perfectly able to discover every corner of this amazing city. Visit Havana’s trendy; Havana Central Park, Bacardi Building, Granma Memorial, Malecon Havana Architecture and of course the Classic American cars of Havana. For a refreshing Daiquiri try the infamous favorite bar of Ernest Hemingway, the Floridita Old Havana. Obviously, it’s not just about Old Havana because to the west there’s the contemporary 50s styles of Vedado, with its hot discotheques, Hotel Capri and towering buildings. As a guest at Casa Ladys in Old Havana you’ll experience so many benefits but we’ll let you discover for yourself!. Furthermore, right from your home stay at Casa Ladys you´re 2 minutes from Havana Malecon, Havana’s coastal esplanade, trendy with visitors and Cubans alike, this broad boulevard skirting the coastline of the city is a crowd-puller for our Habaneros and Habaneras. Visit Paladar San Cristobal or world-famous Paladar La Guarida for great bite to eat. 3 minutes on foot eastward you´ll arrive in Old Havana’s Book Fair Market and the colonial center San Francisco Asis of the old quarter featuring emblematic historical buildings and spirited streets & open-air markets, mixed into amazing Havana architecture. Across the Havana bay you´ll find Castillo de Fuerza Real. Historic sites in old Havana are; Capitolio Havana, Fuente de la India and of course, La Manzana de Gomez building. Let’s not forget the mini cafes and vibrant life within each backstreet. The hip Vedado district is just a few minutes inland, offering a true back to the 50s vibes that people love in Havana Cuba. Casa Ladys provides protected parking for your Old Havana Rent a Car. Many tourists choose to begin their Havana trip in the old quarter of Havana, and then rent a car to discover other places like Cienfuegos, Trinidad or Pinar del Rio. Want to really see Cuba? Organizing to collect your Old Havana Car Rental near Casa Ladys will mean you’re on your way promptly to explore other areas of Cuba after your preliminary time in Old Havana. At Casa Ladys your rented Car is parked right next to your Casa Particular in Old Havana, ensuring immediate access to the numerous attractions near Havana and beyond. Compare our rates for cheap Economy cars in Old Havana to larger 9 seat Minivans in Old Havana when you reserve Casa Ladys, helping you save even more money on your Cuban Vacation. Renting a Car is easily the best compliment to your Old Havana guesthouse! 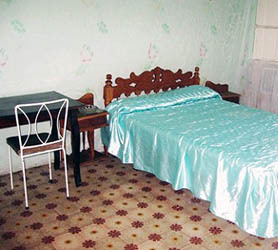 Our booking process is unique because it shows the best rate for Casa Ladys in Old Havana and the exact rooms available for your chosen dates. Our Casa Particular booking network is an industry first for Cuban Homestay properties. Once you’ve compared the rates, finalizing the booking at Casa Ladys takes just seconds and an immediate confirmation is provided in real-time. Casa David y Electra is located in the heart of Old Havana, viewed by many as the perfect place to stay in Havana, with its historic ambience, narrow colonial streets, historic squares and beautiful colonial architecture. Plus, just a 10 minute walk from the old quarter you’ll find Centro Habana and Vedado, while a 10 minute taxi ride along Havana Malecon and 5th Avenue will have you in the upper-class Havana neighborhoods of Playa and Miramar. 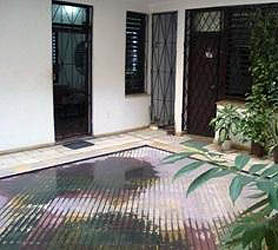 Casa David y Electra is in an exceptional location from which discover Old Havana on foot. Right from your base at Casa David y Electra you’ll be able to first discover Old Havana’s myriad of historic buildings and beyond. Old Havana is both historic and exciting and Casa David y Electra will have you right in the thick of the action. Casa David y Electra provides spacious rooms located in a historic building, all include; shower, refrigerator, TV, air-conditioning and an outside terrace to soak up the sun and people watch. Your Cuban hosts at Casa David y Electra are extremely knowledgeable about Old Havana, offering free advice on uncovering the many mysteries of the old quarter of Havana. You can choose to take breakfast and meals at Casa David y Electra or select from the abundance of cafes and paladar restaurant eateries in Old Havana or the Havana Seafront Malecon, all close to Casa David y Electra. Popular Paladar Restaurants in Old Havana for guests at Casa David y Electra are Restaurant Dona Eutimia and El Bistrot Paladar Restaurant on the Malecon. 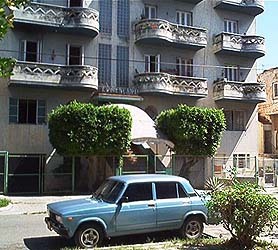 Casa David y Electra provides secured parking for your Rent a Car in Old Havana. Many visitors choose to start their Havana vacation in the old town of Havana, then rent a car to visit other places like Viñales Valley, Playas del Este or Varadero. Feeling adventurous? Arranging to pick up your Car Rental in Old Havana will mean you’re on your way quickly to explore other parts of Cuba after your initial time in Old Havana. At Casa David y Electra your Havana rent a car is parked right next to your Old Havana Casa Particular, guaranteeing quick access to the many sights further afield. Check out our rates for discounted Economy cars in Old Havana to 9 seat Minivans in Old Havana when you book Casa David y Electra, you’ll save even more money on your Cuba holiday. Having a Rent a Car is by far the best addition to your Old Havana homestay! 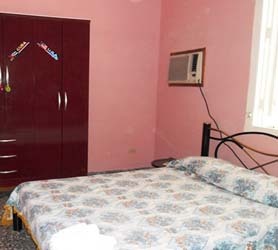 Our booking process is unique because it shows the best rate for Casa David y Electra in Old Havana and the exact rooms available for your chosen dates. Our Casa Particular booking network is an industry first for Cuban Homestay properties. Once you’ve compared the rates, finalizing the booking at Casa David y Electra takes just seconds and an immediate confirmation is provided in real-time. Casa Margot is situated in the core of Old Havana, considered by many as the ideal place to stay in Havana, with its historic atmosphere, thin colonial streets, momentous squares and striking colonial architecture. Yet, just a 10 minute walk from the old town you’ll discover Centro Habana and Vedado. Venturing a little further by way of a 10 minute taxi ride along Havana Malecon and 5th Avenue, you’ll enter the posh Havana neighborhoods of Miramar and Cubanacan. 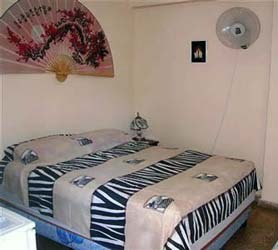 Casa Margot is in an outstanding location from which visit Old Havana on foot. Directly from your base at Casa Margot you’ll be able to view Old Havana’s myriad of historic buildings and facades. Old Havana is both momentous and exhilarating and Casa Margot will have you directly in the nerve center of the old quarter. Casa Margot offers spacious rooms situated in an historic building, all rooms feature; shower, refrigerator, TV, air-conditioning and an outside terrace to soak up the Caribbean rays and bustling street life. Your Cuban hosts at Casa Margot are tremendously clued-up about Old Havana, providing free advice on revealing the many mysteries of the old town of Havana. You can opt to take breakfast and meals at Casa Margot or choose from the wealth of cafes and paladar restaurants in Old Havana or the Havana Oceanfront Boulevard called El Malecon. Close to Casa Margot you’ll find popular Paladar Restaurants in Old Havana such as Restaurant Castropol and Café Neruda on the Malecon. Casa Margot is located right in the center of Old Havana just a short distance from foremost tourist attractions like the National Museum of Music Havana and many more. However, Old Havana is but a short distance from Vedado, Centro Habana and Miramar, so you’re perfectly able to discover every corner of this amazing city. Visit Havana’s trendy; Havana Central Park, Bacardi Building, Granma Memorial, Malecon Havana Architecture and of course the Classic American cars of Havana. For a refreshing Daiquiri try the infamous favorite bar of Ernest Hemingway, the Floridita Old Havana. Obviously, it’s not just about Old Havana because to the west there’s the contemporary 50s styles of Vedado, with its hot discotheques, Hotel Capri and towering buildings. As a guest at Casa Margot in Old Havana you’ll experience so many benefits but we’ll let you discover for yourself!. Furthermore, right from your home stay at Casa Margot you´re 2 minutes from Havana Malecon, Havana’s coastal esplanade, trendy with visitors and Cubans alike, this broad boulevard skirting the coastline of the city is a crowd-puller for our Habaneros and Habaneras. Visit Paladar San Cristobal or world-famous Paladar La Guarida for great bite to eat. 3 minutes on foot eastward you´ll arrive in Old Havana’s Book Fair Market and the colonial center San Francisco Asis of the old quarter featuring emblematic historical buildings and spirited streets & open-air markets, mixed into amazing Havana architecture. Across the Havana bay you´ll find Castillo de Fuerza Real. Historic sites in old Havana are; Capitolio Havana, Fuente de la India and of course, La Manzana de Gomez building. Let’s not forget the mini cafes and vibrant life within each backstreet. The hip Vedado district is just a few minutes inland, offering a true back to the 50s vibes that people love in Havana Cuba. 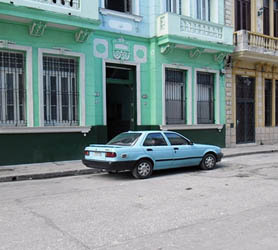 Casa Margot provides protected parking for your Old Havana Rent a Car. Many tourists choose to begin their Havana trip in the old quarter of Havana, and then rent a car to discover other places like Cienfuegos, Trinidad or Pinar del Rio. Want to really see Cuba? Organizing to collect your Old Havana Car Rental near Casa Margot will mean you’re on your way promptly to explore other areas of Cuba after your preliminary time in Old Havana. At Casa Margot your rented Car is parked right next to your Casa Particular in Old Havana, ensuring immediate access to the numerous attractions near Havana and beyond. Compare our rates for cheap Economy cars in Old Havana to larger 9 seat Minivans in Old Havana when you reserve Casa Margot, helping you save even more money on your Cuban Vacation. Renting a Car is easily the best compliment to your Old Havana guesthouse! Our booking process is unique because it shows the best rate for Casa Margot in Old Havana and the exact rooms available for your chosen dates. Our Casa Particular booking network is an industry first for Cuban Homestay properties. Once you’ve compared the rates, finalizing the booking at Casa Margot takes just seconds and an immediate confirmation is provided in real-time. Casa Isabel is situated in the core of Old Havana, considered by many as the ideal place to stay in Havana, with its historic atmosphere, thin colonial streets, momentous squares and striking colonial architecture. Yet, just a 10 minute walk from the old town you’ll discover Centro Habana and Vedado. Venturing a little further by way of a 10 minute taxi ride along Havana Malecon and 5th Avenue, you’ll enter the posh Havana neighborhoods of Miramar and Cubanacan. 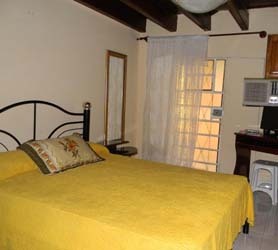 Casa Isabel is in an outstanding location from which visit Old Havana on foot. Directly from your base at Casa Isabel you’ll be able to view Old Havana’s myriad of historic buildings and facades. Old Havana is both momentous and exhilarating and Casa Isabel will have you directly in the nerve center of the old quarter. Casa Isabel offers spacious rooms situated in an historic building, all rooms feature; shower, refrigerator, TV, air-conditioning and an outside terrace to soak up the Caribbean rays and bustling street life. Your Cuban hosts at Casa Isabel are tremendously clued-up about Old Havana, providing free advice on revealing the many mysteries of the old town of Havana. You can opt to take breakfast and meals at Casa Isabel or choose from the wealth of cafes and paladar restaurants in Old Havana or the Havana Oceanfront Boulevard called El Malecon. Close to Casa Isabel you’ll find popular Paladar Restaurants in Old Havana such as Restaurant Castropol and Café Neruda on the Malecon. Casa Isabel is located right in the center of Old Havana just a short distance from foremost tourist attractions like the National Museum of Music Havana and many more. However, Old Havana is but a short distance from Vedado, Centro Habana and Miramar, so you’re perfectly able to discover every corner of this amazing city. Visit Havana’s trendy; Havana Central Park, Bacardi Building, Granma Memorial, Malecon Havana Architecture and of course the Classic American cars of Havana. For a refreshing Daiquiri try the infamous favorite bar of Ernest Hemingway, the Floridita Old Havana. Obviously, it’s not just about Old Havana because to the west there’s the contemporary 50s styles of Vedado, with its hot discotheques, Hotel Capri and towering buildings. As a guest at Casa Isabel in Old Havana you’ll experience so many benefits but we’ll let you discover for yourself!. Furthermore, right from your home stay at Casa Isabel you´re 2 minutes from Havana Malecon, Havana’s coastal esplanade, trendy with visitors and Cubans alike, this broad boulevard skirting the coastline of the city is a crowd-puller for our Habaneros and Habaneras. Visit Paladar San Cristobal or world-famous Paladar La Guarida for great bite to eat. 3 minutes on foot eastward you´ll arrive in Old Havana’s Book Fair Market and the colonial center San Francisco Asis of the old quarter featuring emblematic historical buildings and spirited streets & open-air markets, mixed into amazing Havana architecture. Across the Havana bay you´ll find Castillo de Fuerza Real. Historic sites in old Havana are; Capitolio Havana, Fuente de la India and of course, La Manzana de Gomez building. Let’s not forget the mini cafes and vibrant life within each backstreet. The hip Vedado district is just a few minutes inland, offering a true back to the 50s vibes that people love in Havana Cuba. 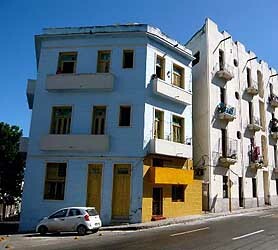 Casa Isabel provides protected parking for your Old Havana Rent a Car. Many tourists choose to begin their Havana trip in the old quarter of Havana, and then rent a car to discover other places like Cienfuegos, Trinidad or Pinar del Rio. Want to really see Cuba? Organizing to collect your Old Havana Car Rental near Casa Isabel will mean you’re on your way promptly to explore other areas of Cuba after your preliminary time in Old Havana. At Casa Isabel your rented Car is parked right next to your Casa Particular in Old Havana, ensuring immediate access to the numerous attractions near Havana and beyond. Compare our rates for cheap Economy cars in Old Havana to larger 9 seat Minivans in Old Havana when you reserve Casa Isabel, helping you save even more money on your Cuban Vacation. Renting a Car is easily the best compliment to your Old Havana guesthouse! Our booking process is unique because it shows the best rate for Casa Isabel in Old Havana and the exact rooms available for your chosen dates. Our Casa Particular booking network is an industry first for Cuban Homestay properties. Once you’ve compared the rates, finalizing the booking at Casa Isabel takes just seconds and an immediate confirmation is provided in real-time.